Charles Darwin Second voyage around the world go on. Collection Darwin2 and FitzRoy's Hypothesis. The fourth trip. 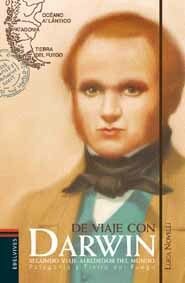 The fourth book in the series Traveling with Darwin. The Bible says that the Flood had engulfed the Ancient Kingdoms and killed all animals except those which were in the Ark. This was the strong belief (not really a scientific idea) of Captain Robert FitzRoy, Darwin's travelling companion and forerunner in climate sciences. and glaciations, forgotten empires and extinct creatures , where and when pre-history has become myth. 224 pages, 4 dossiers, 600 original photos, maps and drawings. On February 9, 2009 Charles Darwin will achieve his second voyage aroa voyage, which took place between 2005 and 2008, almost 90.000 kms. have been covered by plane, bus, rubber-dinghy and car. The voyage has produced three notebooks with a nineteenth-century look, provided with a rubber-band like the famous moleskine. They are printed in China and published in Italy by Editore Rizzoli, in Germany by Random House and in Spain by Edelvives. In the three notebooks Charles Darwin himself relates about his second voyage, by noting the paradoxes and the differences between his time and ours. (The members of the mission and other travellers on Beagle's course will then celebrate Darwin's birthday at La Genova, the oldest Italian restaurant in Mayfair ). Am 9. Februar 2009 wird Charles Darwin symbolisch seine zweite Weltreise im Natural History Museum in London vollenden. Das Projekt Charles Darwin / Die Zweite Weltreise wurde von Luca Novelli, Verfasser von wissenschaftlichen Buechern fuer Jugendliche, im Fruehjahr 2005 vorgeschlagen und von WWF, dem italienischen Komitee von ICOM (International Council for Museums-UNESCO) und dem Naturhistorischen Museum in Mailand, gesponsert. Darwin 2 brachte seinen Erfinder und eine kleine Gruppe von Freunden und Wissenschaftlern an den Plaetzen wo sich Darwin zwischen 1831 und 1836, waehrend seiner Reise an Bord des Beagle, aufgehalten hatte. Um dieses Projekt zu verwirklichen wurden zwischen 2005 und 2008 fast 90.000 Klm. per Flug, Bus, Auto, Schlauchboot zurueckgelegt. Die Reise ergab drei XIX.Jahrhundert-aehnliche Notizbuecher, die - wie die bekannten Moleskine - mit einem Gummiband versehen sind. Sie werden in China gedruckt und in Italien vom Rizzoli Verlag, in Deutschland von Random House und in Spanien von Edelvives veroeffentlicht. In den drei Notizbuechern berichtet Darwin persoenlich ueber seine zweite Weltreise, wobei er Widersinne und Unterschiede zwischen seiner und unserer Zeit anmerkt. Am 9. Februar werden Kopien der drei Buecher der Bibliothek des Natural History Museums ueberreicht, gelegentlich des Besuches von Luca Novelli und seinen Reisegefaehrten auf der Darwin gewidmeten Big Idea Ausstellung. Zusammen mit anderen Reisenden auf Beagle ' s Kurs wird dann Darwins Geburtstag im aeltesten italienischen Restaurant La Genova in Mayfair gefeiert. Le 9 fevrier 2009 Charles Darwin terminera symboliquement au Natural History Museum a Londres son deuxieme voyage autour du monde. Le Projet Charles Darwin / Deuxieme Voyage autour du Monde, avait ete' propose' par Luca Novelli, auteur de livres de science pour les jeunes, en printemps 2005. Il a ete' sponsorise' par WWF, le Comite' Italien de ICOM (International Council of Museums - UNESCO) et le Musee d ' Histoire Naturelle de Milan. Ce projet a amene' son auteur et un petit groupe d ' amis et naturalistes dans les lieux touches par Darwin pendant son voyage a' bord du Beagle entre 1831 et 1836. Pour le realiser on a du parcourir entre 2005 et 2008 a' peu pres 90.000 klm en avion, bus, voiture et zodiac. Ce voyage a produit trois carnets, genre XIXeme siecle, pourvus d ' un ruban elastique, comme les fameux moleskine. Ils sont imprimes en Chine et publies en Italie par Rizzoli Editori, en Allemagne par Random House et en Espagne par Edelvives. Dans les trois carnets Charles Darwin lui meme raconte son deuxieme voyage en annotant les paradoxes et les differences entre son temps et le notre. Copies des trois volumes seront donnes a' la Bibliotheque du Natural History Museum lundi, 9 fevrier, pendant la visite de Luca Novelli et ses compagnons de voyage a l ' Exposition Big Idea, dediee Darwin. Par la suite on verra d ' autres voyageurs sur la route du Beagle chez La Genova , le plus vieux restaurant italien a Mayfair, pour feter l ' anniversaire de Darwin. El 9 de febrero del 2009 Charles Darwin concluye simbolicamente a Londres, en el Natural History Museum, su Segundo Viaje alrededor del mundo. El Projecto Charles Darwin/second Voyage around the world habia sido propuesto por Luca Novelli, autor de libros de ciencias para chicos, en la primavera del 2005. Fue' realizado con el patrocinio del Wwf, del comite' italiano de la ICOM (International Council of Museums-UNESCO) y del Museo de Historia Natural de Milan. El Projecto Darwin2 ha llevado al autor y a un pequeno grupo de hombres de ciencia amigos a los lugares visitados por Darwin durante el viaje con el Beagle entre el 1831 y el 1836. Para realizarlo entre el 2005 y el 2008 han sido recorridos casi 90.000 kilometros en avion, omnibus, barcos y auto. El Viaje ha producido tres quadernos de viaje de aspecto del siglo diecinueve, provistos de elastico como las celebres moleskine. Estan imprimidos en China, y editos en Italia por Rizzoli, en Alemania por Random House y en Espana por Edelvives. En los tres quadernos Charles Darwin cuenta personalmente este segundo viaje, senalo' los paradojos y las diferencias entre su epoca y nuetros dias. Copias de los tres tomos seran donados a la Biblioteca del Natural History Museum lunes 9 de febbraio durante la visita de Luca Novelli y de sus companeros en la exposicion Big Idea, dedicada a Darwin. Por ultimo, la comitiva se encontrara' con otros viajeros sobre la ruta del Beagle en The oldest Italian Restaurant en Mayfair - La Genova, para festejar el cumpleanos de Darwin. Il 9 febbraio 2009 Charles Darwin concluderà simbolicamente a Londra, al Natural History Museum, il suo Secondo giro attorno al mondo. Il Progetto Charles Darwin/second Voyage around the world era stato proposto da Luca Novelli, autore di libri di scienze per ragazzi, nella primavera del 2005. E' stato realizzato con il patrocinio del Wwf, del comitato italiano della ICOM (International Council of Museums-UNESCO) e del Museo di Storia Naturale di Milano. Il Progetto Darwin2 ha portato il suo autore e un piccolo gruppo di amici scienziati nei luoghi toccati da Darwin durante il viaggio col Beagle tra il 1831 e il 1836. Per realizzarlo tra il 2005 e il 2008 sono stati percorsi quasi 90.000 chilometri in aereo, bus, gommoni e auto. Il Viaggio ha prodotto tre taccuini dall'aspetto ottocentesco, muniti di elastico come le celebri moleskine. Sono stampati in Cina e sono editi in Italia dall'Editore Rizzoli, in Germania da Random House e in Spagna da Edelvives. Nei tre taccuini Charles Darwin in persona racconta questo suo secondo viaggio, annotando i paradossi e le differenze tra il suo e il nostro tempo. La missione infine si ritrovera' insieme ad altri viaggiatori sulle rotta del beagle in The oldest Italian Restaurant in Mayfair - La Genova, per festeggiare compleanno di Darwin. and Tasmania plus other Darwinian locations. Milan, a Gallery run by Jacopo and Antonio Tabarelli. 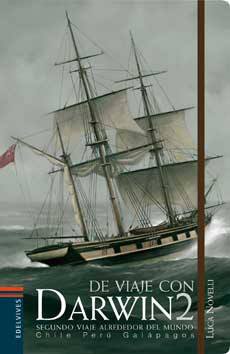 The third book on Charles Darwin/ Second Voyage around the World (Tahiti, New Zealand, Australia, Cocos-Keeling islands) is published in Italy by Rizzoli/RCS Libri.It will be available at the Frankfurt Bookfair 2008. The introduction is written by Giulio Giorello (University of Milan). The Project is completed, including the first remake of Darwin's voyage. (It was registered as a project for the Rolex Award for Enterprise n.163, April 2005) .The Project has been supported By WWF Italy, the Italian Committee of ICOM (International Council of Museums) and the Museum of Natural History of Milan. Charles Darwin/ Second voyage around the world ended at the Heathrow airport after having covered between 2005 and 2008 almost 90.000 kilometers around the world using a wide variety of means of transport. Luca Novelli and some of his travelling companions will attend the Frankfurter Buchmesse and will be present at the stands of Rizzoli/RCS Libri and of the other publishers of the books on the Darwin 2 Project. The photograph shows Luca Novelli with three members of the first mission: Ingrid Gattermann, Federico Canobbio Codelli, Francesco Balladore (Canal Beagle, December 2005) . "In this book it is Charles Darwin himself who speaks about his extraordinary voyage, but many important and sometimes unbelievable details would not have come to light if Novelli did nt rightly give them back the freshness which had been removed by a sometimes more commemorative than scientific historiography". "Luca Novelli, who brilliantly unites scientific culture, divulgation ability and artistic qualities, reproposes Darwin 's extraordinary voyage in the contemporary context, which is entirely different from that of the early 19th century". "This is an open invitation to understand the serious problems facing humanity and environment today, without forgetting the past , but using it reasonably in order to assist science in furthering sustainable developments". Tahiti-New Zealand- Australia- Cocos Keeling- Mauritius: this step is done. Press Release March 27. 2008. Luca Novelli has accomplished the third and most important step of the remake of Charles Darwin's voyage around the world. At the Bologna Bookfair for young people( March 31st - April 3rd ) pictures as well as a reportage will be available about the journey he made together with his travelling companions from Tahiti unto the Cocos Islands, where Darwin had worked out the theory of the atolls . The Darwin2 Project , sponsored by WWF Italy and by the Italian Committee of ICOM (International Council of Museums), started in 2005 and brought Novelli to cover during 4 years a distance of about 90.000 kilometres through 10 countries and more than 120 museums and protected areas born on Beagle's way. Aim of Novelli 's project is to rewrite with today's eyes "The Voyage of the Beagle" , published by Darwin in 1839, focusing the environmental and anthropological differences between his observations and present reality.Now, after his voyage made in January and February 2008, Luca Novelli is working on the texts and drawings of the third volume: Polynesia, New Zealand, Australia and Tasmania. This book, as well as the previous volumes (Voyaging with Darwin 1 and 2) will be published in Italy by Fabbri/RCS Libri. The first two books which already appeared are published, or on the way to be published, also in Spain, Germany, Corea and other European and extra-European countries. 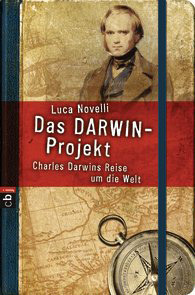 The Darwin2 Project arose in view of the bicentenary of Darwin's birth (Darwin Day February12,2009) The third volume of the saga will be available at the Frankfurt Bookfair 2008. RAI Educational, and programmed in 2008. Luca Novelli thanks all those who supported in various ways this phase of the Project and especially the Tahiti Tourist Authority, Canon Italia, Nokia, GoAustralia, Tour 2000, Fabbri Editore/RCS Libri, Rai Educational, the magazine Tuttoturismo, Cape Horn for the clothing, the Centre of Scientific Culture Alessandro Volta in Como, the Rotary Club Baradello, WWF Italia and ICOM, Italian committee. Press Release 5th December 2007. On wednesday, 2007, december the 5th, at the Libreria Rizzoli, Galleria Vittorio Emanuele II 79, Milan, at six o'clock pm, Giulio Giorello, Beatrice Masini and Nicoletta Salvatori will present the book Travelling with Darwin Vol.II, written by Luca Novelli and published in Italy by Fabbri/Rcs.The book is about the journey through the Straits of Magellan and the Galapagos Islands, from the glaciers that break in the Pacific Ocean to the Islands of the giant turtles. Foreword by Gianfranco Bologna, scientific director of WWF, and Daniele Jalla, president of ICOM (International Council of Museums), Italy.Cover by Giovanni de Conno, GOLD MEDAL of the American Illustrators, inside drawings and photographs by Luca Novelli and other members of the mission. Also drawings and illustrations by the companions of Charles Darwin during his first mythical journey. is published in Italy by Fabbri/RCS libri, it will be available at the Frankfurt Bookfair 2007. -in this book much attention is given to ecology and climatic changes-. On 12th February 2009 Darwin Day will be celebrated. At that time two hundred years have passed from Darwin's birth. For this occasion Luca Novelli, the popular science author, during the year 2005 begun to make again the voyage around the world that Darwin did between December 1831 and October 1836, in order to re-write - with the knowledges we have nowadays - The voyage of the Beagle, putting the accent on the difference and changes occurred. In these first steps Luca Novelli was accompanied by Federico Canobbio Codelli, philosopher and painter, Francesco Balladore, photoreporter, and Ingrid Gattermann, naturalist. In the book, Charles Darwin in first person tells about his new voyage around the world. He describes with astonishment the innumerable novelties and the people he meets, comparing with those of his first voyage with the Beagle. He compares the glaciers of nowadays with those he saw at the beginning of the Industrial Revolution. He discovers huge deforested territories and the big towns founded on the land once green and desert. He tells about evolution, but also about the climate that changes under his eyes. The first book tells about the Atlantic steps and is published in Italy by Fabbri/RCS. It will soon appear in Spain and South Korea and within the year it will be published by other European and International countries. At the Bologna Children Bookfair (April 2007) it is possible to look at the first images of the second book on Pacific Ocean steps: Chile, Peru, Galapagos. It is a 10.000 km voyage along the South American western coasts, from the glaciers falling into the ocean to Chiloe island, from the Andes to Mendoza in Argentina and Lima in Peru. And again to Galapagos, the last frontier of Nature and Land. In this book too - as planned in Charles Darwin project - The second voyage around the world - you could find the list of museums and protected areas sprang up along the Beagle route. In fact the project is sponsored by WWF and ICOM (International Council of Museums, UNESCO). Luca Novelli thanks the technical sponsors of this latest experience: Canon Italia, CapeHorn, Nokia, Tour 2000 and Tuttoturismo magazine.